Come joins the artists as we talk about mental health and how it affects all of us and especially in the black community through our art. Check out Taraji P. Henson on The Breakfast Club who spoke about mental health. 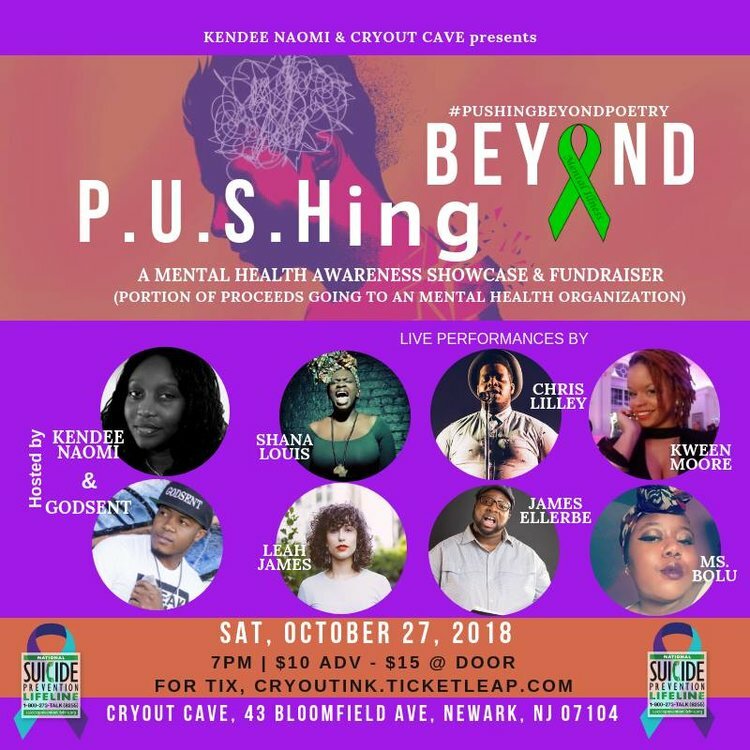 This was a powerful interview, and the roster of artists are going to share some phenomenal art on this very important topic at the PUSHing Beyond | Mental Health Awareness Show & Fundraiser. Come hear our stories. Click the flyer below and video for interview. James C. Ellerbe was born, and currently lives, in New Jersey with his wife. He graduated from Hackensack High School and Gibbs College (formerly in Livingston, New Jersey) with an Associate’s Degree in Computer Network Administration. He has appeared on a BET’s "Buy The Book" and a non-taped edition of the world-renowned "Showtime at the Apollo" showcase in which he and other poets helped promote the first spoken-word event at a venue called "Poetic Battles." He represented New Jersey’s team for this event. He also performed at the Kola Note (Site of Montreal, Canada’s Jazz festival), Elizabeth High School, Rutgers University, NJIT, Fairleigh Dickinson University and Sarah Lawrence College, and appeared on WLIB Radio NYC. Recently, James was also a finalist for the 2017 Indie Author Legacy Award for Poet of the Year, and featured author at the BCCLS BooksNJ 2015 and 2017 Book Festivals at Paramus Library in Paramus, NJ. He also wrote and co-produced his three-act play, "A Dream Preserved." "Beyond the Event Horizon" is his first book of poetry published in April 2015 by Let It Flow Publishing, and "Pulsar" is his first spoken word album released by Not Enough Words LLC on April 2018.